If you are looking for a dining set for your medium-sized patio or deck area, more than 10 feet square, this 5 piece patio dining set will work well. The faux wood table-top and chair backs will look good on a wood or composite deck. The cushions will be great for comfort when relaxing after the meal is over. If you are looking for dining for four for under $300 for your outdoor space, this set will both fit well and look good. Meals will be able to sit on the table for every one to make their plates without having a meal cart close by. If you need more information to see if this set will work for your outdoor space, read my information below. You will get two boxes when your dining set is picked up or delivered. The table box is about 43 inches square and 3.5 inches thick. It will weigh 51 pounds. Chair box is 28 inches long, 26 inches square and will weigh a hefty 79 pounds. This set is made of steel, so it will be heavier and stay in place during higher winds. The Frames of the table and chairs are made of steel with a black powder coated finish. The table-top has a faux finish to look like wood, it is still steel, chair backs are also finished in a faux wood look. 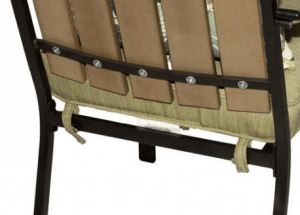 Seat for the chairs is made from plastic straps to support the cushions. The table is 40 inches square and 28 inches tall. It does have a hole in the middle for an umbrella (umbrella and stand not included in this set). Four straight legs will support the table at the corners and no lower support for the umbrella on this table. The faux wood center is built in and not removable. Chairs are 27 inches deep, 23 inches wide and 19.5 inches tall. Seat is 20.25 inches deep, 19.5 inches wide and is 15.75 inches off the ground. Each chair will support 300 pounds. Cushions are made with Olefin fabric rated for 800 hours outside. The polyester pillows are rated for only 300 hours of outdoor exposure. I would store the pillows and cushions when not in use for longer outdoor life. See some of my storage solutions here. There is a matching umbrella for this set. I will give you the information in the next article. Umbrella stand will have to be purchase separately, see some of my choices here. This is a fine sturdy set for the medium-sized patio area. The steel construction and faux finish will match many outdoor decors. Assembly is where most complaints come from in this set. Some state than the parts do not line up when trying to put together. I have had some trouble with some of the metal sets I have put together with the parts bending during shipping. Some minor modifications with the parts may be needed to assemble this set. All tools needed for assembly are included in the hardware kit. The table legs are in four sets, with two legs on each set. The legs attach at the corners to make this table very sturdy. First set the table to upside down on a surface than will not scratch the top, I like to use the box it came in. Attach a set of legs on opposite sides, then the other two sets of legs. The legs will attach to each other with two screws up the legs. Make sure than you do the final tightening with the table sitting on the legs on a level surface for the best results. Chairs will require you to start with attaching the seat base to the bottom back legs. The back section attaches to the top of the back legs. Each arm will have to be attached next. Make sure it is on a level surface before the final tightening of the screws. Only use a mild soap and water when cleaning your dining set. Any harsh chemicals even glass cleaner will damage the powder coated finish. A liquid wax is recommended for the painted surfaces once a year, depending on your outdoor environment. The cushions should be stored out of the outdoor environment to last more than just a few seasons. 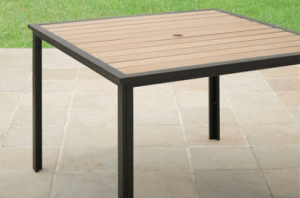 If you are looking for a 5 piece patio dining set for your outdoor space, the Better Homes and Gardens Jade Avenue set from Walmart.com will look good on any wood or composite deck. Seating for four with cushions for comfort, faux wood for design, this set will give you many years of use with the proper care. After you get past the assembly, you can enjoy this set. You will not need a lot of storage for the four cushions and pillows. Thanks for reading, please share with your friends on your social networks. There are some affiliate links in this article, if you use one I may make a small commission. This will not affect the price you pay for your purchase. Wow, a patio set for under $300 sounds incredible! I think the set looks very well made and would make a good addition to anyone’s patio. As a woman, I am always hesitant to buy a “needs assembling” product, so do you think it would be too hard to put together? The chairs look very comfortable and the table is big enough for a nice meal for 4. Thanks for your review and I will certainly look into this deal some more! This is a great set for under $300 if you have a medium sized outdoor space. The metal will last a long time with the powder coated finish. The cushions and pillows will need to be stored when not needed. I love the outdoors what I don’t enjoy is cleaning the bird pooh off the seats from my outdoor furniture, but what I like about what you mentioned is the coverage of the umbrella, and the powder coated paint that makes it last longer. 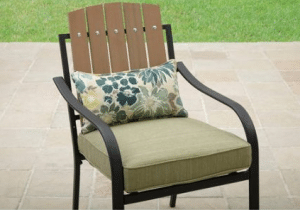 Getting a outdoor furniture cover for your seating is not that expensive. See some of my examples in this article by using this link. Just remove the cover and you are ready to use. This works great if your patio furniture is under a tree or other object the birds like to roost in.